Tata’s Tiago is the longest and tallest of the bunch. Despite that, the WagonR has the longest wheelbase. The first row of all three cars is a mixed bag, with no clear winner. WagonR offers more space in the second row, but Santro has the bigger seat. Tiago offers marginally more knee room in the second row compared to the others. 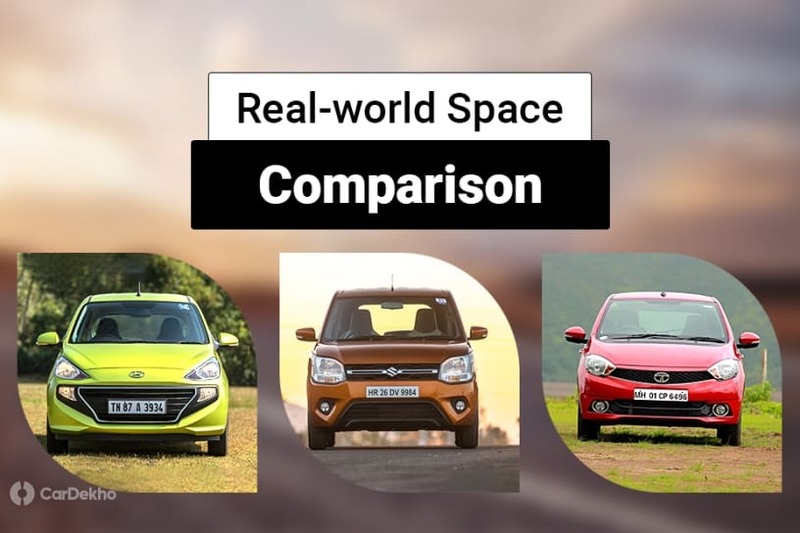 The new Maruti Suzuki WagonR has picked up right where the old WagonR left off, giving its opposition, the Hyundai Santro and Tata Tiago, tough competition. We compare these three to find out which one offers more space inside the cabin. However, before we get on with that, let’s have a look at the exterior dimensions of these cars. The Tiago is the longest and widest car in the comparison while the WagonR is the tallest and has the longest wheelbase. How does this translate into space inside the car? Find out below. The Tiago is the longest of the bunch and that allows it to have the most legroom in the first row. Taller passengers will be more comfortable in the first row of the Tiago, especially if they have long legs. Being the widest, the Tiago also offers the most amount of cabin width in the front row, and the driver and co-passenger will feel more spacious in the first row of the Tiago than the other two. Maruti’s WagonR, on the other hand, offers the most knee room in the first row. The Santro’s seat base is the longest, thus offering more under thigh support, which will be a boon on long journeys. However, the Tiago has the widest seat and so it will be able to accommodate wider passengers more easily. The WagonR has the tallest seat back so people with a longer torso will be more comfortable in it. Also, being the tallest car in this trio, it offers the most headroom inside the cabin in the first row. This will again be a boon for those who are taller. In the second row, the WagonR leads the race for shoulder room, despite not being the widest car in the comparison. It makes use of its height again and offers the most headroom here as well. So it will be more spacious for seating three abreast and taller passengers will be more comfortable in the second row, compared to the other two. The Tiago offers the most knee room, but not by much. The Santro’s seat base is again the longest and widest in this comparison. Its seat back is also the tallest of the three, and the end result of all these superlatives is that the Hyundai hatchback offers the most comfortable seat of this trio, making it a lifesaver on long journeys.